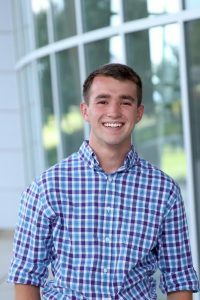 Zach Fetter is a senior with majors in finance and youth ministry from Charlotte, North Carolina. This summer, Zach is an operations intern at Hill Country Bible Church in Austin. As the fiscal year starts on September 1st, leaders across the church have been building budgets for their respective ministries. Zach has met with more than fifty leaders to work through and approve their budgets in preparation for the new fiscal year. He is helping build a projection for the church’s giving numbers for the next year and will present those to the executive pastors and elders. Zach is also in charge of implementing new goal software for the staff that will lead to the improved alignment of the church’s goals from top to bottom. Zach has also had the opportunity to receive feedback in a job that has helped guide how he approaches his day-to-day. Every week, Zach has a one-on-one with his boss, one of the church’s executive pastors. These one-on-one meetings have grown him the most this summer, both spiritually and professionally. In those meetings, Zach is commended for what he has done well but is also guided through areas in which he can improve. Zach has taken the advice very seriously and applies it to his job and life, as he knows this feedback will help him become a better leader of a church someday. One thing that has struck Zach in his time at Hill Country Bible Church is the wholehearted submission to God that is evident in every staff member and in the church overall. “The one thing that has been crucial to everything I have done in my internship has been a reliance on God,” says Zach. “The way that the leadership of the church relies on faith and prayer is evident.” Zach has learned that the church could not conduct their business as effectively as they do if they did not consistently give up control and wait to see what God will do through their organization. This is a principle that he believes goes beyond Hill Country Bible Church and his internship and is something that he will remember and apply when he returns to Abilene and for the rest of his life.